How can I crop a PDF to the same size as original PDF file? The original PDF is of A4 size, but when I cropped it with A-PDF Page Crop, the size became smaller, how can I save it in A4 size? 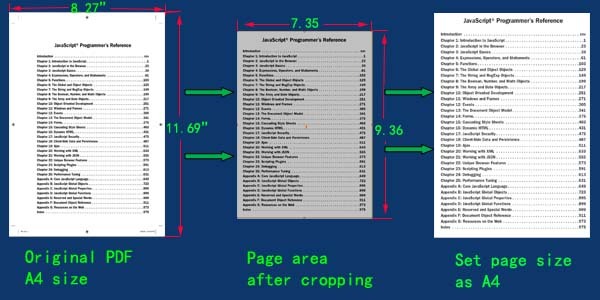 In addition to helping you crop page of PDF, A-PDF Page Crop (free download here) also enables you to set output size for the new PDF file. 5. Click "Crop and Save as" button to choose output path, and then you will get a PDF that of the same size as original file.